And yet, if it wasn’t for my test drive notes, I’m pretty sure I would’ve forgotten the Forte. Its styling is handsome and will certainly age well, but it’s not bold nor particularly memorable. The gray paint doesn’t help. The interior is well-equipped and sensibly laid out, but I had to consult the photo file to recall what it looked like. The Mazda3 and new Toyota Corolla had no such problems. The driving experience, which is perfectly pleasant and vice free around town, merely manages to demonstrate poise and not be flummoxed by mid-corner heaves when pushed on a mountain road. Multiple drive settings are included — a nice touch — and although Normal is just a little too light and numb, even when driving on the highway, the Sport setting dials in just the right amount of extra effort. So too does the “Smart” setting, which I assume lived up to its name by figuring out how I’d prefer my steering. So this compact Kia comes standard with a neuralizer from “Men in Black” that wipes out your memories after contact. Oh well. Because what it lacks in memorability, it makes up for with that general foible-free goodness. A similarly equipped Honda Civic Touring would be a few hundred more. The 2020 Toyota Corolla XSE sedan would cost at least $1,000 more and not include as much equipment. Ditto the new 2019 Mazda3 sedan. And I should also note the Kia’s value proposition is much clearer on the lower end of its trim structure. The Mazda also has a conventional six-speed automatic while the rest feature different takes on the continuously variable transmission. 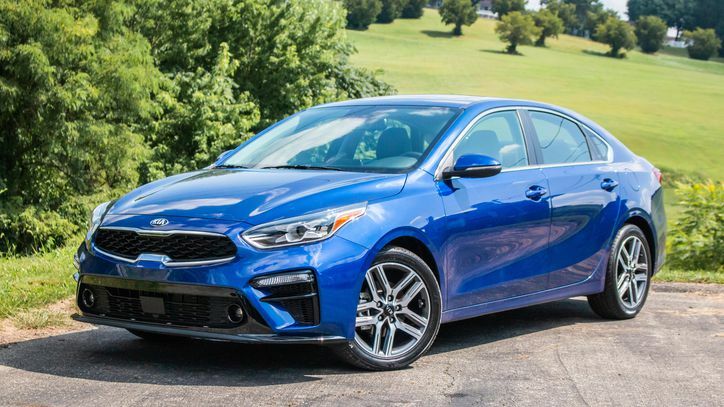 Although it doesn’t possess the Corolla’s integrated planetary gear, the Kia’s CVT also manages to feel like a cross between a dual-clutch automated manual and a CVT. Although the Forte’s powertrain is indeed perfectly pleasant for running those errands around town, taking one on a test drive up an on-ramp and making a passing attempt will probably reveal its deficiencies regardless of who’s behind the wheel. In this way, I do remember the Forte, and not in a good way. As Reese Counts noted in his 2019 Forte first drive, an engine upgrade is needed — preferably not tied to the CVT.